Our retreats are journeys…journeys into your deepest self, inspired by soulful singing bowls, and breathtaking landscapes. Stillness. We listen, reconnect inward, heal, rediscover the simple and profound. When we get out of our own way, we can discover the vitality and creative spark we yearn for in our lives, no matter what form it may take. 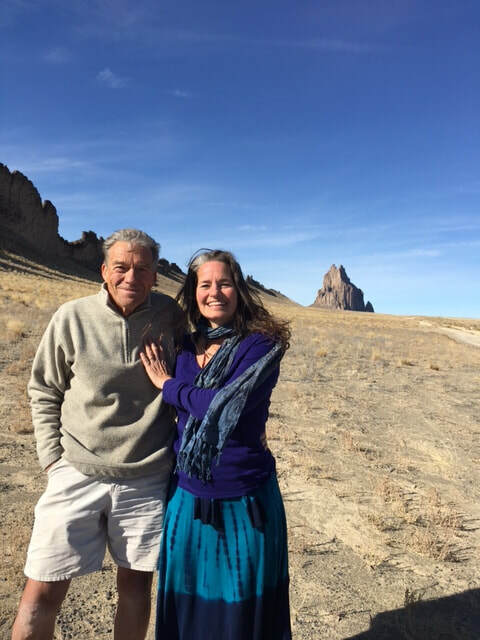 Stacy and David cultivate an environment of compassion, acceptance, and encouragement. We co-create an intentional oasis--away from the daily routine--where you can discover who you really are, and dismantle the blocks which keep you stuck. It's a great way to work through transitional moments in your life, heal, and recharge. We look forward to meeting you, and to beginning our journey together! Our approach borrows from Native American myth, traditions & culture, Carl Jung's writings, dreamwork, synchronicity, archetype, principles of quantum physics, Paul Petzholt's leadership training, meditation practices, and many other influences that resonate and inspire us. working with Sound and Voice! (we are grateful to Father Leo and his staff for their generosity, letting us use this visually and acoustically inspiring space). The mini-retreat will be the first of periodic retreats where we will work on voice, the sound we create from within ourselves--our bodies, our minds, and our hearts. The voice is our signature, and beautifully unique. We will co-create a supportive, inspiring space to explore its multi-faceted qualities--its resonances, its power, its tenderness. We can become more conscious, alive and empowered in our embodied voice. Speaking aloud passages and phrases that are deeply meaningful, feeling them travel through our bodies and through the external world is a powerful experience, one in which we can feel truly heard and also express and claim who we are! The acoustics of the sanctuary--its stones carrying the sound for 6 seconds--allows us to hear longer the journey of our own voice moving through the sanctuary and back to our ears. Finally, an intrinsic part of this mini-retreat is our active awareness and honoring of our completing the circle of speech within the energetic whole--the concept of "listening into speech." It is the awareness that the group, with their honoring presence, listens the speaker into speech. The power of receptiveness is a part of the vocalized sound, and deeply important for our speech. It's an important concept to live into and honors a principle often invisible in our lives and in our world. 9:30am, Introductions: to each other and to ideas of embodied voice, feeling resonance, locating place in our body from which we speak. 15 minute Singing bowl meditation, to clear and settle us to begin our work together. Witnessing our voices moving within and outside of our bodies, into the sanctuary and then back to our ears. Honoring ourselves and each other. Folks will bring a passage or poem that has personal meaning, and read it aloud in the acoustically alive space, one at a time. (We hope to have time for each person to read twice if you desire, to play with different qualities of voice if you wish). Contact Stacy to sign-up, or for more questions....Use Contact Form at bottom of page. A day retreat within a special, undisclosed location deep within the Montana natural landscape, and deep within our own internal landscape. David and I are grateful for the time spent with all our fellow "spiral" retreat participants, you all are very special! Hike into site after introductions, short history, and moment of reflection. We begin the spiral inward into stillness. Enter the site, and hear the sounds of crystal singing bowls and a dancing creek to carry us into meditation. Disperse throughout the landscape for quiet individual reflection, and choices of journaling, watercolor painting, coloring, hiking, meditation. Closing and foot ceremony. We prepare for the spiral outward. Hike out, following the creek. We make the spiral outward, making the mindful journey outward again. What do we bring with us? How do we want to show up in our lives moving forward? (Monthly, from January-June 2017, in our offices). The mini-retreats were filled with singing bowl meditation, group conversation, time for quiet individual contemplation and creative exploration through journaling, watercolor painting, coloring mandalas, or individual meditation. A perfect small, supportive getaway into silence and renewal. 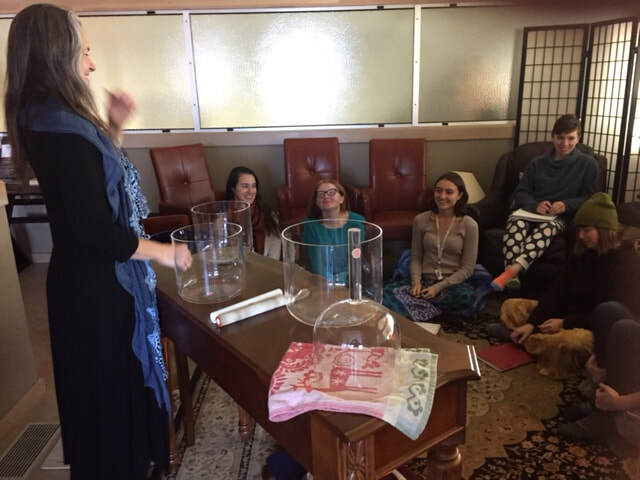 MSU Professor Elizabeth Croy brought her "The Arts and Healing" class to our offices for a 'field trip.' What an incredible group of people formed this very special class. We enjoyed every moment with you all! ​Thanks to the Gallatin River Lodge for their beautiful space!